Much of eastern Colorado will be at risk for severe thunderstorms Friday afternoon, with potential for heavy rain, golf ball-size hail and tornadoes. Moisture has been increasing across the region, which is expected to produce scattered showers and thunderstorms starting in the early afternoon. Storm potential across the United States May 18, 2018. The most severe storms will be north of Highway 50 to the Colorado-Wyoming border. Storms are expected to continue into the evening. Wind gusts exceeding 60 miles per hour are possible. Flooding and flash flooding could occur later in the day, particularly in the northeast. 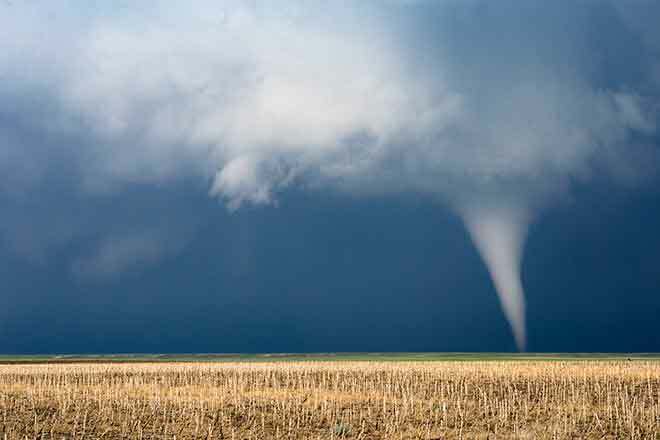 Tornadoes will also be a possibility across much of eastern Colorado Friday afternoon, including Kiowa County. Despite the expected storms, Baca county and eastern Las Animas county will be under a red flag warning for high fire danger beginning at 2:00 p.m. If fires do start, people in the area should be prepared to evacuate with little notice. Southeast Colorado remains in extreme drought. Temperatures across the plains will be in the 80s for the southeast, and 70s further north. Adding to the interesting weather mix, a winter storm watch will be in effect Friday night into Saturday for the north central mountains. Heavy snow is possible, bringing eight to 18 inches of new snow to the area.